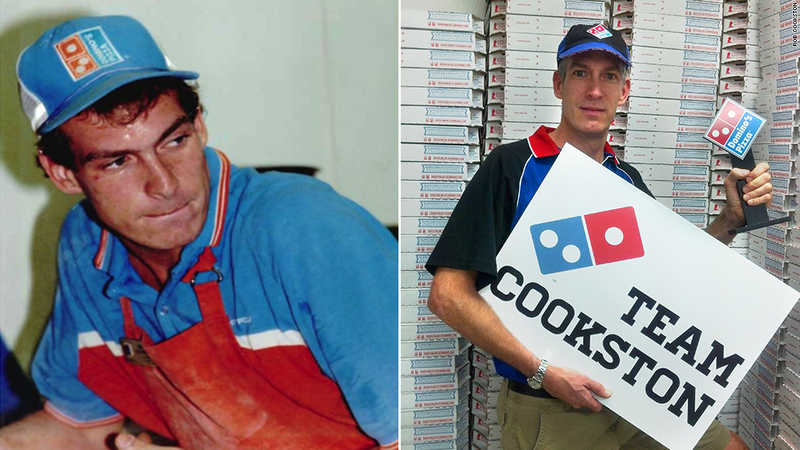 Rob Cookston went from Domino's Pizza deliveryman (left) to manager in 1989. Today, he owns 18 Domino's franchises. Twenty-five years ago, Rob Cookston got his start delivering Domino's pizzas from his cherry red Volkswagen Beetle. Today, he owns 18 of the chain's franchises. "I was 19, not in college and looking for money," he said. "I worked my way up the Domino's system. That's the American dream." It's a common story among Domino's Pizza (DPZ) workers: 90% of its franchises are owned by former deliverymen or entry-level workers, according to Tim McIntyre, a Domino's spokesman. About 4,500 of the pizza chain's U.S. stores are run by franchisees, while the company operates nearly 400. Right off the bat, Cookston was bringing home about $500 a month as a deliveryman -- pretty good money for a teenager in 1987 still living at home with his parents in Virginia. Still, Cookston was drawn by the potential of doing a lot better. Just seven months into the job, he heard that store managers got paid upwards of $100,000 a year. But it was when he saw his franchise's owner driving a yellow Ferrari -- a similar model to the one featured in the popular television show "Magnum P.I." -- that he enrolled in the manager training program. He learned how it's done at a Domino's Pizza store -- from basic restaurant skills like saucing 50 pizzas in an hour and massaging dough so it doesn't harden into "hockey pucks," to accounting tasks like managing payroll. After two years, he moved out of his parent's house and started as a manager-in-training at a Domino's in Reston, Va. He made $89,000 in his first year. The store had five phone lines, each of which had to be answered every time it rang. All orders had to be delivered within a half hour. 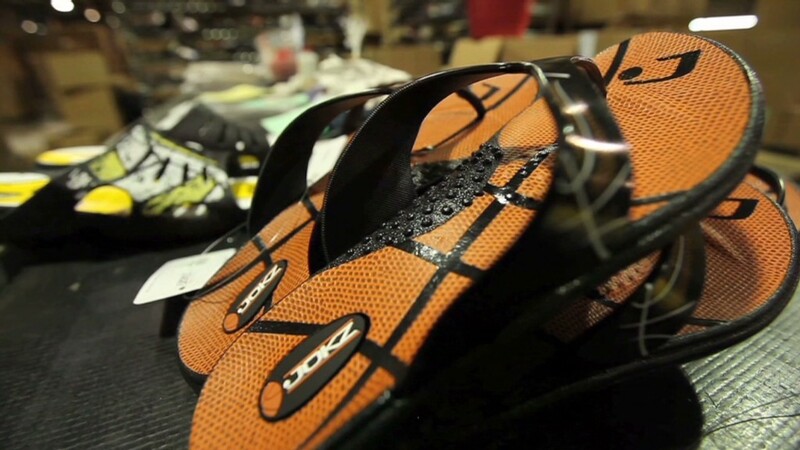 "It was a big challenge. I wanted to quit at times," he said. "We'd take turns giving each other shoulder massages we were so wiped out." Soon, Cookston was managing six stores. But it wasn't enough. He was desperate to become an owner and run his own Domino's Pizza franchise. According to Domino's spokesman McIntyre, managers are eligible to go through specialized training called franchise management school after a year in the position. Five years after he became a manager, Cookston borrowed money from his parents and grandparents and bought his first Domino's franchise on 23rd Street in New York City in 1994. For the next five years, the newly-minted store owner lived in the basement of another Domino's branch in the city and saved enough to buy two more locations. At the time, he was making about $200,000 a year. By 2000, he expanded into Connecticut and Long Island, buying and selling stores along the way. All told, he has owned and operated 32 stores, including some of the busiest Domino's locations. He's been able to pay it forward, too: Seven of his own deliverymen have gone on to become store managers. Cookston said he now lives "insanely comfortably" with his wife and two daughters in Connecticut. He never did get that yellow Ferrari. He settled for a 1967 blue Corvette. "Domino's taught me everything about hard work and what it takes to run a business," he said. "I believe if you can make it at Domino's, you can make it anywhere."